Choosing a charter yacht is an exciting process, but those brand new to the superyacht experience risk making a less-than-perfect decision if they’re not armed with the right information. You really don’t want your yachting vacation to be tainted by silly regrets that could have easily been avoided. Because we understand that the huge range of charter yachts and terminology can be a bit daunting for first-time charterers, we’ve created this introductory guide for chartering motoryachts, to help you narrow down your choices and present your charter broker with some guidelines on what type of yacht you’re looking for. Remember, the more information you give your charter broker, the better they’ll be able to match you with your dream yacht. 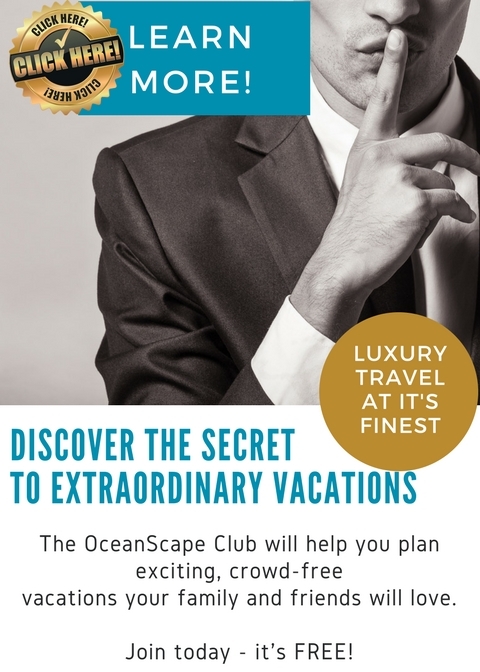 Learning these basics also makes you feel more confident and informed about the process of chartering a yacht, which we’re big believers in here at Oceanscape. This may sound a tad boring, but it’s incredibly important, as the hull type plays into matters of speed, stability, comfort, and fuel costs. In motoryachts, there are three main types of hulls to choose from: full displacement, semi-displacement, and planing. This hull type displaces water equal to its weight and sits low in the water, pushing through the waves rather than over them. Why do you care? On the plus side, this type of hull is the most fuel-efficient, and generally offers the smoothest, most stable, most seaworthy ride. On the downside, full displacement yachts are also generally the slowest, with an average cruising speed of 10 knots, although fast displacement yachts are now entering the market. This hull type has more flatness in the aft of the vessel, and uses more horsepower to generate a little bit more lift, reducing the bow’s drag in the water. Why do you care? Speed is the real payoff to semi displacement yachts, with an average speed of 10-20 knots, meaning you can cover more ground on your charter and get between islands more quickly. The downside is that your fuel bills for the charter will be higher due to the higher horsepower needed to slightly lift the yacht’s bow, and you will lose some of the stable, seagoing comfort of the full displacement hull. Planing yachts use their powerful engines to lift the yacht’s bow clear of the water altogether, skimming over the waves and reducing friction with the surface. They are also called ‘performance yachts’, or ‘go-fast’ yachts. General Conclusion: If you prize seagoing comfort and fuel efficiency, charter a full displacement yacht. If you crave high speeds and want to cover a lot of ground, charter a planing yacht. 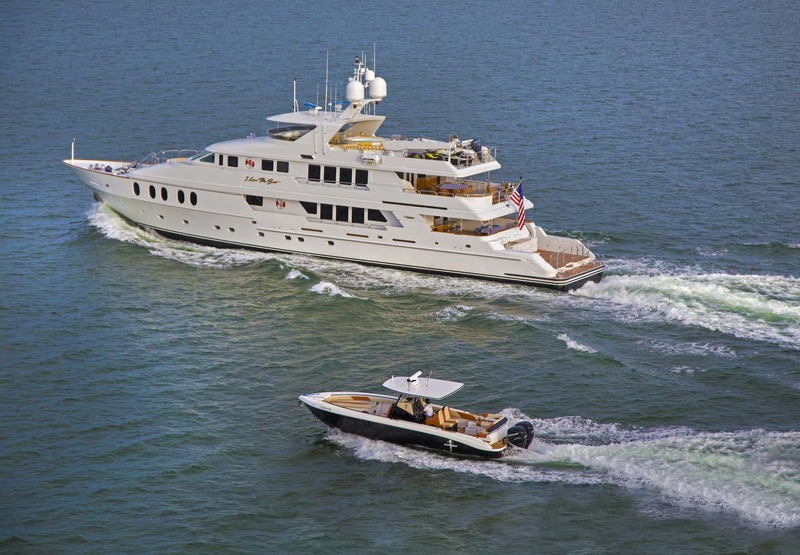 If you want a compromise between the two, charter a semi-displacement yacht. 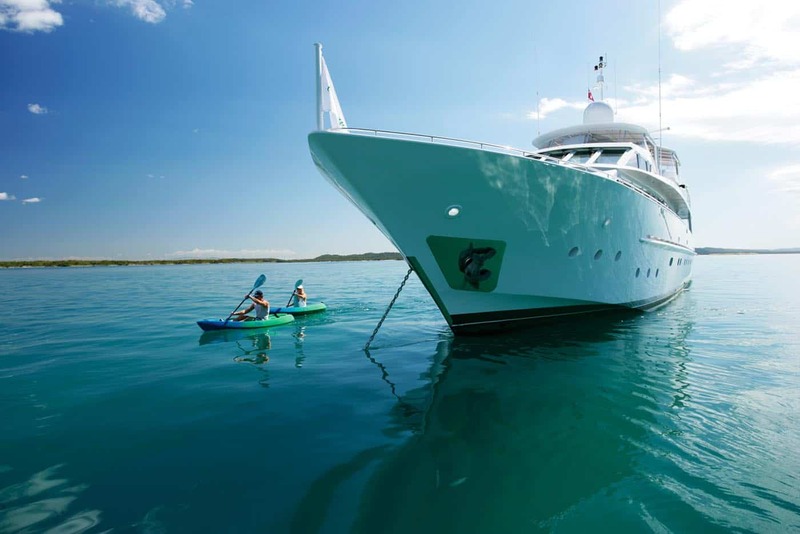 Draft (or draught) is another important element to consider when chartering a yacht, particularly if you are intending to visit shallow cruising grounds like the Bahamas. Draft, put most simply, is the depth between the waterline and the yacht’s lowest point. This number will determine how deep the water under the yacht needs to be in order to avoid running aground. If you’re a charterer who wants to be able to drop anchor right in close to beaches, look for a yacht with a shallow draft. If you require good stability at anchor on a displacement yacht, you’re going to want to look out for yachts with ‘zero-speed stabilizers’, also known as ‘at anchor stabilizers’. Because this is quite modern technology, zero-speed stabilizers tend to be found on newer or recently refitted yachts. Those chartering planing yachts will be on the lookout for ‘gyro stabilizers’.? ?When thinking about stabilizers, consider how you’re going to use the yacht. If you’re planning to spend a lot of time at anchor or if anyone in your group suffers seasickness, zero-speed stabilizers will come in very handy. Also chat to your broker about typical sea and weather conditions in the place you’re going, as this may determine how important the yacht’s stabilization system will be to your enjoyment onboard. Ok, that’s the technical part out of the way. Now for the fun stuff, where you get to pore over online yacht listings, look at the gorgeous pictures and figure out what type of yacht layout and interior design floats your boat. But before you get carried away and book a yacht on a whim, try to have a look at the ‘yacht specs’, that is, the layout plans. 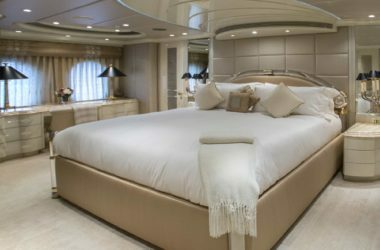 Many online yacht listings will have links to the plans of each deck so you can see how the cabins and communal spaces are laid out in relation to each other, and what size beds are in each room. (It can often be hard to figure it out from the photos!) If the listing doesn’t have the plans online, ask your broker to give you a run-through on how the yacht is configured. The first obvious step is thinking about guest numbers, and where they’re all going to sleep. Most yachts have a 12 guest maximum, although some larger yachts have commercial licenses, meaning guest numbers are increased. Think realistically about how much space you need and the logistics of cabin shares, particularly if you have children who may not want to share together. (Unfortunately, sibling rivalry doesn’t always vanish at sea.) 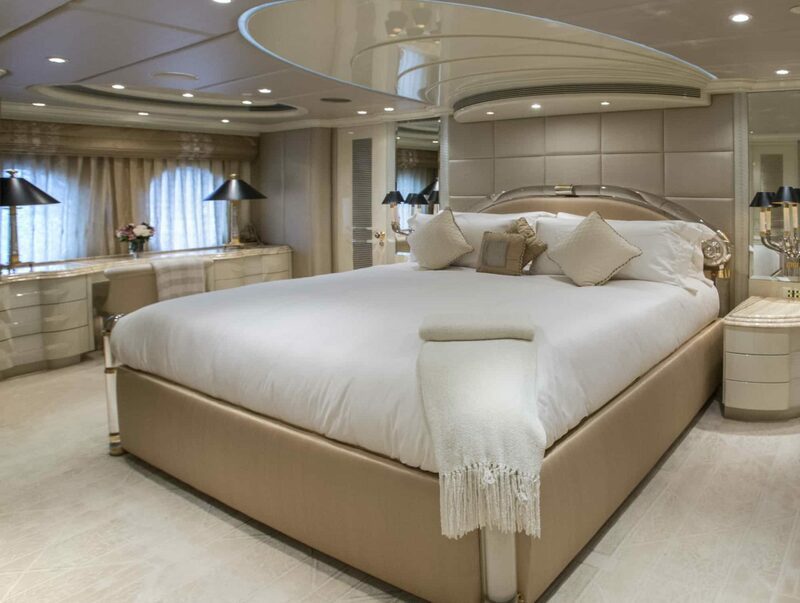 Some of the most popular charter yachts have convertible cabins where the beds can change from twin to double, depending on your group’s makeup. If you’re chartering with another couple/family and splitting the costs, it can sometimes be hard to find a yacht that has similar standard of master cabin to VIP cabin, which can sometimes cause a little resentment between the adults! Your broker’s advice will be invaluable here. Tip: Something to look out for in older yachts in the 30-40m range is the neat feature of the split-stairwell accommodation, where the master and often one other cabin are located down a private stairwell, with the VIP and remaining cabins reached via another stairwell located further aft. This can be a great solution for shared family charters. On larger yachts, keep your eye out for an upper deck VIP, where the spectacular elevated views go a long way to consoling the couple who didn’t get the master suite. If you are chartering with children, think about the yacht’s décor and features. Is it a comfortable yacht well-suited to a family, or are there a lot of fragile antiques and decorations? Is there space for the kids to relax and play, and is the deck space completely enclosed? Your broker will easily be able to recommend child-friendly yachts and family-friendly charter destinations, so just ask. Also, take a moment to think about what will happen if you get bad weather during your trip. 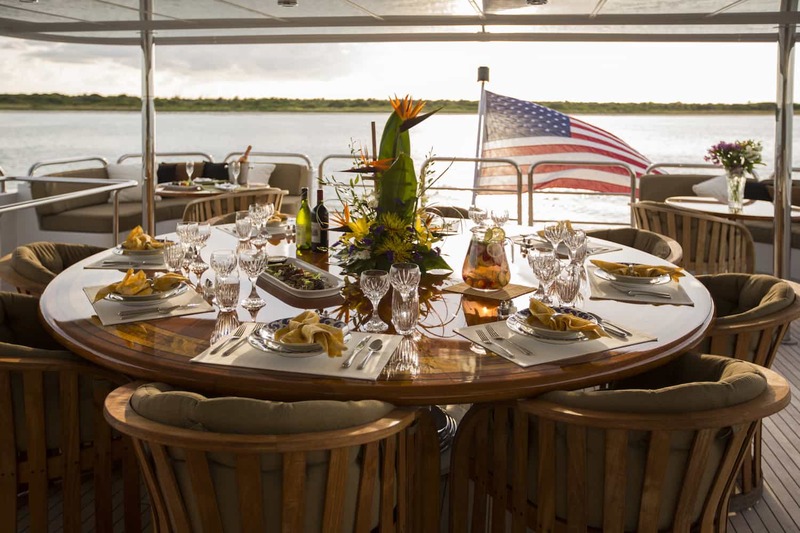 Is there an indoor dining table or a covered table on deck? Is there lots of entertainment on board? If the sea is rough or the yacht is underway, is there a Jacuzzi onboard to cool off on hot days and keep the kids happy? Particularly for family charters, the watertoy selection is extremely important, with a range of sports suitable for all ages involved. If you dream of swimming off the yacht every morning, you’ll want a yacht with a swim platform for easy access to the water, while the fitness-obsessed can charter a yacht that carries gym equipment. If your family loves watching movies, select a yacht with a really comfortable salon or even an outdoor screen for moonlit movie nights, while those of you who want to stay connected will need to ask your broker about Wi-Fi capabilities and expected speeds in the cruising area. As any seasoned yacht charterer will tell you, the crew often matters more than any feature of the yacht. While all crews deliver a high standard of service, it’s important to know that different yacht crews often excel at different things. If you’ve got young kids, ask your broker for recommendations for crew who have a reputation for excelling with children; if you’re a foodie, look for a yacht with an award-winning chef. If you want to be pampered throughout your holiday, seek a yacht with an onboard masseuse, and if you’re active, charter a yacht with watersport instructors on board. There are so many different crew skills these days, so just be open with your broker about what makes you happy on holiday. Also talk to your broker about what kind of experience and service style you’re after. Do you like friendly service and lots of interaction from the crew, or would you prefer something a bit more formal and inconspicuous? Do you like family-style buffets, plated meal service, or fine dining? All of this information will allow the broker to get a really good picture of what kind of crew are the ideal match for your group. This might seem like a lot of information, but really, it’s just the basics of choosing the right yacht to charter. Your charter broker can do it all for you of course, but how well do they really know you and your family? And if you’re brand new to yachting, you’ll also be able to impress your broker with your knowledge of hull types, draft, and stabilizers, ensuring that you get the yacht that suits your cruising needs. The more you know, and the more you tell your broker, the more perfect your yachting experience will be. Any questions? We’re always here to answer them, so please don’t hesitate to call.